I’m not going to try to predict your sleeping patterns. Not yours or that of your loved ones. But after reading Pure Sleep reviews on some forums, I decided to take the anti snoring mouthpiece for a test drive. I have the verdict! I’m writing this review for snorers like me. And since you are on this site, I pretty sure I wont be wrong to suggest that you also having a snoring problem. Or someone really close to you has the problem. Many people are embarrassed to admit that they are snorers. You shouldn’t be. Did you know that actually 30% of people who are 30 years and above actually snore? More appalling statistics show that one partner in two thirds of married couples complain of their better half’s snoring condition. There are actually marriages that have been broken just by snoring problems! So, is there anything that can be done to help people who snore? The answer is yes. There are several anti snoring devices and products that have been cleared by FDA that eliminate snoring. One of them is the Pure Sleep snoring device. In this review, we will have an in-depth look on this device. ABCs Good morning America has done an excellent job in advertising Pure Sleep as an impeccable snoring solution the best shot for babies, women and men. Behind this advertisement, however, is a fascinating story of the invention of the unique device. Dr. Douglas Fenton, a dentist residing in San Francisco, created this spectacular mouthpiece while thinking of an idea to help his patient stop snoring. His idea was to come up with a device that average families battling with the snoring condition could afford. Having watched his patients parting with as much as 400 USD for simple snoring guards from other medics, his motivation was to avail something much more affordable. And he did. Pure Sleep got to the top of the chart as the best mouthpiece for people who snore. Although statistics have placed Pure Sleep at the top of the chart of best selling stop-snore devices, you may be curious to know how it compares with the other mouthpiece devices. Is it really as effective as the manufacturer and advertisements claim? Pure Sleep is categorized under Class II medical devices. These are devices people have to purchase only with a doctors prescription. We know that snoring is caused by constriction of the airway, which makes the throat tissues to vibrate against each other. Pure Sleep is a Mandibular Advancement Device i.e. a device that open the air passage by moving the lower jaw forward. When Pure Sleep mouthpiece advances the lower jaw, the size of the upper airway is increased. In effect, this reduces the pressure or air disturbance that causes snoring or sleep apnea in other instances. I have used other stop snoring devices before. So, after reading reviews on the official Pure Sleep website, I went ahead and ordered one. I have written this Pure Sleep review based on my honest opinion after using the device. 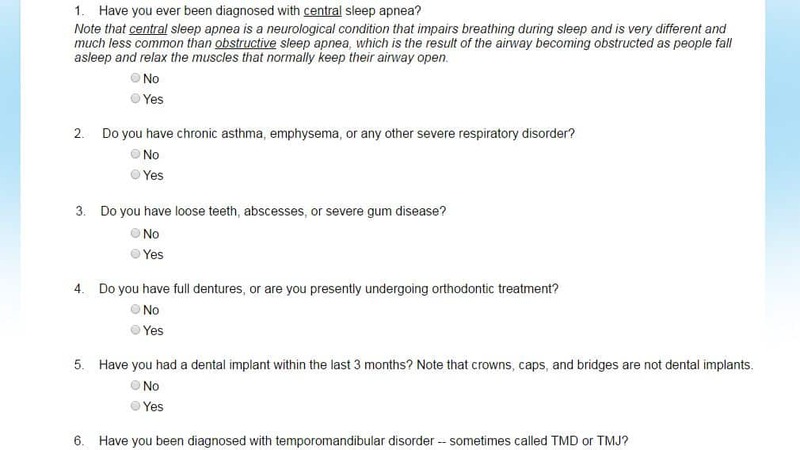 The first thing that intrigued me was the questionnaire I had to fill while ordering Pure Sleep online. It had a total of 21 questions! Don’t get me wrong, I didn’t have a problem answering the questions. Most of them were simple Yes or No types. I just found the questionnaire too long and overly time consuming. I know that the company uses the questionnaire to assess a person’s compatibility with the advice. This is why I carefully read and answered every single question with uttermost honesty. 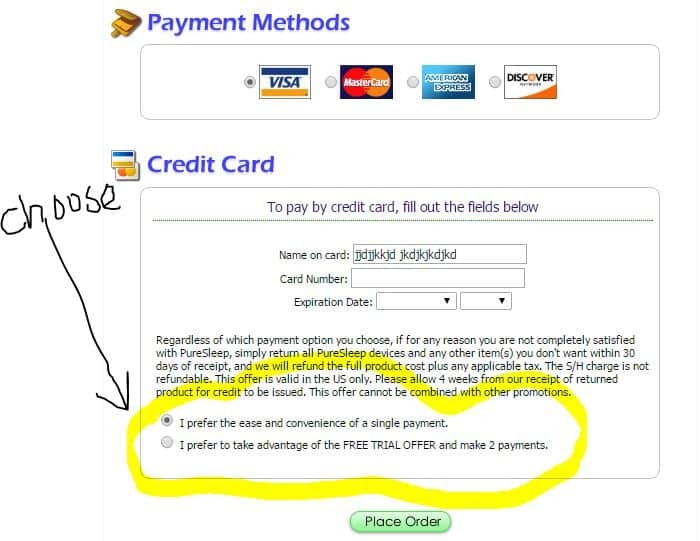 However, you don’t have to answer a questionnaire if you order Pure Sleep on Amazon. After completing this process, I got to access the order page. I must admit my first reaction to the order age was confusion. I was expecting to see the $9.95 always advertised first. Instead a $59.90 amount is what came up. Either way, I just clicked on it and was directed to the payment page. At this juncture, the$ 59.90 amount made sense to me. I was given the option of paying a full amount of two snoring mouthpiece devices (for $59.90) or paying for a trial device. ($9.95). I took the $9.95 trial. The wait then began. Though it took just a little over 72 hours for the mailed package to reach me, I had really become impatient. I guess I was just too anxious to try out the gadget. The short mailing period was however a big plus on their side. Update: For Pure Sleep price in UK, please check this Amazon link. The packaging of the device was meticulous. There were two separate pieces enclosing an instruction sheet. Since I have tried other mandibular mouthpieces before, setting up Pure Sleep and fitting it was no hustle at all. Nevertheless, I was extremely careful in the whole process because I didn’t want to ruin anything. So, it took me a little longer to fit it than is expected. The adjustment level offered by PureSleep is amazing. It actually made me think how it would be so efficient if all snoring mouthpieces offered this. It makes fitting the device so much easier. And you can achieve the level of perfection desired quicker. But one disadvantage about customization levels in devices is it can restrict you to change position once settled. This may mean getting another device altogether. My first night with Pure Sleep mouth piece in my mouth was amazing. The extreme caution I had taken while fitting was worthwhile. The device actually felt as though it had been customized for my mouth. My partner was impressed of how the device had worked. He admitted he never heard me snore at all. I loved how the anti snoring mouthpiece felt so smooth in my mouth. The Latex-free plastic and BPA used to make it are actually worthwhile. I noticed that I drooled a lot on the first day. But the more I used the device, the better things got. The drooling and other symptoms improved. For the next 7 or so days that I used the anti-snoring gadget, I got to believe that it indeed befits its status. It is a perfect competitor to the ZQuiet and Zyppah brands. When reading other Pure Sleep reviews, I did not find instructions on how to set up the gadget. Thus, I’ve decided to provide the instructions. Here is a highlight of how to set up Pure Sleep to custom-fit your mouth. Make sure you read the device instruction manual to get clearer instructions. Caution: Be careful when choosing your setting, it is irreversible. Test the temperature with the back of your hand then place it in your mouth. Bite on it for 45 seconds to form an impression. Warning: You may or may not experience sore jaw or some other type of discomfort the first few days you have the device on. This will diminish with time. Like many anti-snore mouthpieces, Pure Sleep works by pressing the lower jaw forward to keep it in position hence enabling the airway to remain open. 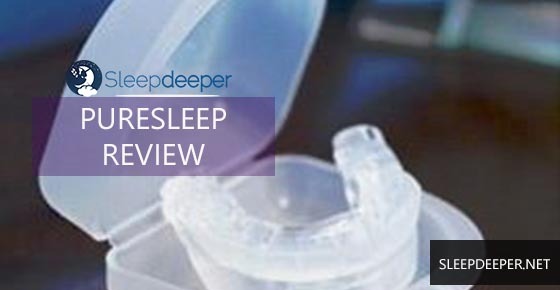 As I said before, I have tested other anti-snore mouthpieces prior to testing pure sleep. Though for the most part I was impressed with this gadget, some features did not meet up to my expectations. Feel free to add on to these strengths and weaknesses in the comments if you have also tested this device. It has a FDA clearance, which makes it safe and authentic. Has a breathing hole so you don’t have to worry about breathing through the mouthpiece. It has limited setting chances. Once you mould it, it is hard to re-adjust the setting. The checkout process was annoying. So, you have to be patient if you really want to give this product a try. The first days of use caused sore jaws. However, this can also be expected of other mandibular mouthpiece devices. The Pure Sleep device is a mandibular advancement mouthpiece device that opens the airway by moving the lower jaw forward. When this is done, snoring is eliminated. Not only is PureSleep FDA-approved, but it gives users the freedom of molding to custom fit their mouth. I had a wonderful experience so I would recommend you to test it out, especially now that it has a free trial offer. Should I Purchase Pure Sleep Anti-Snore Device? One thing I always caution people reading anti snoring device reviews (for example Pure Sleep reviews) is that one brand that works for me may not be particularly perfect for you. Since this device has a free trial, I would advise that you take advantage and test it. With the over 100 anti snoring mouthpiece in the market, you are never going to find the perfect one for you except if you test them out. Sorry about your experience with PureSleep. Not all mouthpieces will work for everyone. Generally, I recommend buying PureSleep from Amazon as you can be sure of getting a refund within 30 days if it doesn’t work for you. Here is the link to PureSleep on Amazon. If you are still searching, I recommend you go with Zquiet. So far, I haven’t gotten any complaints about it. I’ve given the link to the official website, from where you will have a 30 days moneyback guarantee. Don’t buy Zquiet from third party websites like Ebay.